In his highest grossing movie, Elvis shares the screen with Ann-Margret, easily creating the most electrifying teaming Elvis had on screen. He plays Lucky Jackson, a Grand Prix race driver working at a casino to raise cash for a new engine; she’s a hotel swimming instructor - and the romantic action revs up from their first meeting. George Sidney, who also directed Ann-Margret in Bye Bye Birdie, combines the hormonal heat wave with fascinating sights of ’60s Las Vegas. The soundtrack is presented in Dolby Digital 5.1 stereo. - Commentary by Steve Pond, rock journalist and author of "Elvis in Hollywood"
Yeah. 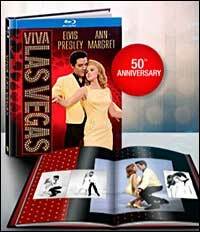 If they'd have waited until now to release "Viva Las Vegas" on BD, I would have bought this. Of course there is a certain percentage of Elvis fans who will buy both. Keep milking the cash cow. Reissue after reissue,enough with this move already! I've already got this on BD. I'm not buying it again for the special features or the pretty pictures. Great but is this also in Region B (Europe) ?